Pitch invader jumps from wheelchair during World Cup match. Tuesday’s pitch invader back on his feet. It’s a classic drunken fan move: Run out onto the field in the middle of a [insert any sport here] game. During the World Cup, you’d expect to be pretty tight. But that didn’t stop an ambitious pitch invader from making his way onto the field, briefly interrupting Tuesday’s U.S. versus Belgium match. If you were wondering how on earth someone could get onto the field during one of the most tightly guarded sporting events in the world, here’s your answer: He pretended to be disabled. 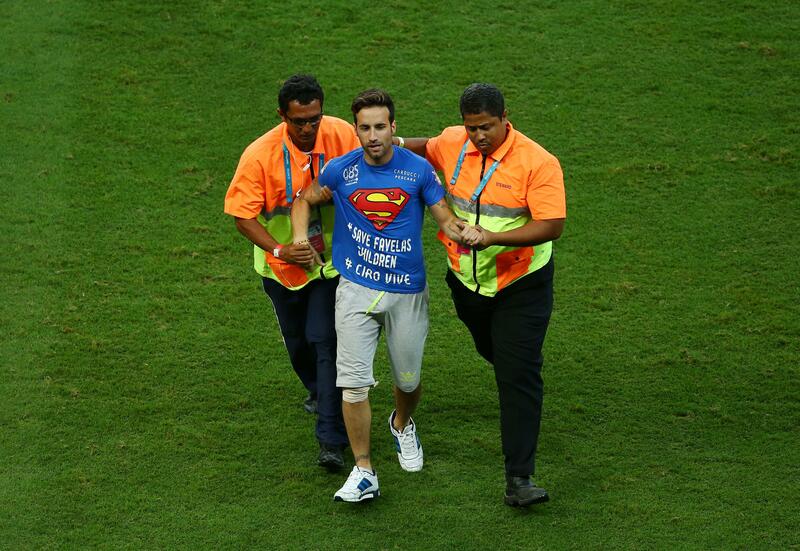 Here’s serial pitch invader, Italian Mario Ferri, hopping out of a wheelchair and making a beeline for the pitch.